Evolution And Airplane Security : 13.7: Cosmos And Culture In recent years, airplane service carts have found a new role in security. It's a striking example of the sort of co-adaptation that is often at work in natural biological evolution, says Alva Noë. On my way to Vancouver by air recently, I found myself wondering about the practice of using service trolleys to block access to the cockpit when the pilots need to unlock their secured doors to come aft. The problem is a real one; opening the door to the flight deck gives would-be maniacs a chance to rush the cockpit. The question is: What's the fix? Over the years, there have been repeated calls for enhanced cockpit security with the requirement that additional barriers should be installed. The Air Line Pilots Association, International, or ALPA, in 2007 called for a "secondary barrier, accompanied by standardized procedures for protecting the cockpit door when opened in flight." Other advocates, such as Ellen Saracini — widow of Victor Saracini, a pilot of United Airlines Flight 175, which crashed into the south tower of the World Trade Center during the 2001 terrorist attacks — have worked hard to lobby Congress to mandate such protections. But, so far, without success. United Airlines, one of the few airlines that originally moved to have barrier mechanisms installed, has actually changed course. United has opted to have Boeing remove the devices from its new fleet of 787s (the Dreamliner). Why? Is it because the locking gates are too expensive? Is this just another example of business refusing to act without government mandate and government failing to act out of lack of the will to resist business interests? Or could it be that the barriers are, finally, ineffective? The ALPA report, mentioned above, suggests that the secondary barriers would supply "5 seconds" of additional protection. Is that enough to justify the expense? Or maybe there is a legitimate worry that the new standard could make things worse, making it even harder to storm a cockpit that had already been invaded by hijackers? This brings us back to the humble, low-tech solution on display before me on my flight to Canada. Provisional, to be sure, and rough and ready. 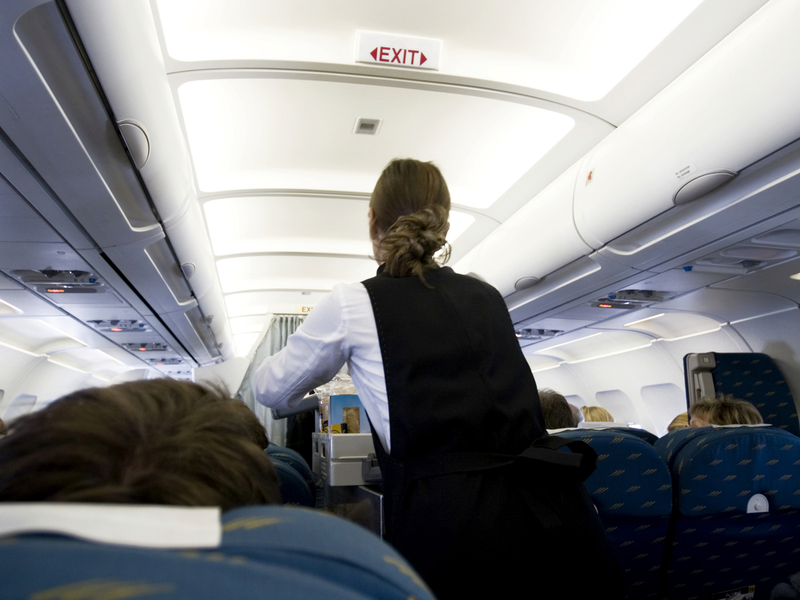 The heavy food and drink carts are pushed across the aisle, blocking easy access to the cockpit. Then the flight attendants gather around and, as it were, staff the barricade. It's certainly not foolproof. As my United flight attendant said, when I asked him about the practice, all this does is slow down an attacker until you, the passengers, come to help. I don't find it hard to believe that it could slow them down, at least for 5 seconds, possibly presenting a similar effectiveness with regard to time to the higher-tech solution. The flight attendant agreed with me warmly when I remarked that the trolley barricade had another benefit as well: It brings the crew together in solidarity. It's quite a stirring gesture. With their actions, they announce that they are en guard, on the job, focused on the task of protecting us. I'm not sure who originally came up with the idea to use the carts — flight attendants, or maybe an industry executive bent on saving money. But, regardless, this is a striking example, in the domain of technology, of the sort of co-adaptation — or productive use of accidental side-effects — that is often at work in natural biological evolution. Galley carts were designed, initially, to be stable, compact and shiftable. And this is a difficult balancing act. Too shiftable and they'll fall over. Too heavy, and they can't be shifted. If you've ever watched a frail flight attendant struggle to keep one of those carts from crushing feet and elbows, it's clear that the trolley is, at best, a barely satisfactory solution. Enter the standing threat of terrorism, and the corresponding shift in the ecosystem inside the cabin. Now, it is precisely the heavy awkwardness of the trolley that recommends it (that, as Darwinians awkwardly put it, selects for it). You can imagine, going forward, that airlines would now deliberately aim at bulky, unwieldy carts. Skeptics about the power of adaptation to explain evolutionary change will point out that the protective qualities of the trolley are an accidental side effect, no more selected for than the sound that a heart makes while it beats. But more hard-core adaptationists would be right to reply that precisely what explains the tendency of the protective qualities of the carts to proliferate is the added survival value they provide. I can easily imagine technological fixes that could change the rules again. But, reclining in my airplane seat and watching the flight crew carry out its duties so admirably on my recent flight, I felt like I had a ringside view of evolution at work.